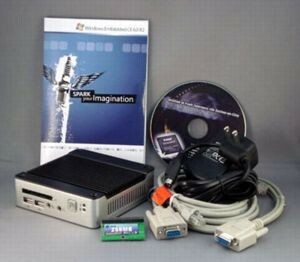 The eBox-4300 Windows Embedded CE 6.0 R2 SPARK JumpStart Kit includes the following. - eBox-4300, an embedded system built with a 500Mhz Via processor, 512MB DDR2 RAM, VGA, integrated Audio, 10/100 Ethernet, two Serial ports, 3 USB 2.0 host, PS/2 keyboard and mouse. - 512MB IDE bootable flash storage preconfigured with DOS boot-loader and working CE 6.0 image. - Full version of Microsoft Windows Embedded CE 6.0 R2 Platform Builder. - Full version of Microsoft Visual Studio 2005 Professional. - Step-by-step guide to build Windows Embedded CE 6.0 image using Platform Builder tool, setup the development environment and develop Visual Studio 2005 application. - Board-Support-Package, SDK and pre-built Windows Embedded CE 6.0 image. - RJ-45 Crossover Ethernet & Null Serial modem cable, use to link eBox-4300 to Windows Embedded CE 6.0 Platform Builder development station for image transfer and debug. Built with a 500Mhz processor, 512MB RAM, integrated USB 2.0 host, Ethernet, Audio, and Video with support for broad range of display resolution, the eBox-4300 is suitable for embedded application requiring a fast processor with multimedia support.